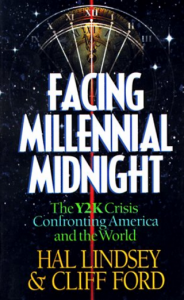 There are now a number of books dealing with the Y2K problem. I received this book as a gift and was familiar with Hal Lindsey. The book paints a pretty gloom picture of January 1, 2000. He could have titled it, “The Late Great Planet Earth II.” There is no doubt that much of this kind of information is fascinating (I mean, to realize the extent to which our world is interconnected electronically). I wonder if Edison ever imagined it! Since the book was written in 1998, a few comments (such as a Japanese collapse in April, 99) have already been less than predicted. I wonder how many other predictions will wane.